Here I am in the our newly re-elected President's ancestral homeland, Nyanza Kenya, literally an hour's drive from his grandmother's home. 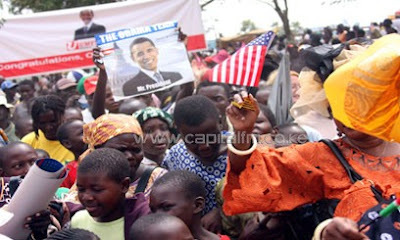 I'm not all that surprised that I'm surrounded by Kenyans who are also rejoicing in this win. He's their guy, son of a local man risen to the highest heights imaginable. I expected this jubilation. What I didn't expect was this reaction from my Kenyan friend: “Wow, that Mitt Romney gave such a nice concession speech. He really praised Obama and even wished his family and two girls well...” She kept going on about what a nice speech that Mitt Romney gave. Yeah, I thought cynically, graciousness in defeat is a requirement of politics. Anything other than that would make him look like a jackass. I may have even said something along those lines. My friend, ignoring my dismissiveness carried on, “And it was close! Half the country voted for him, and he still conceded so nicely.” She shook her head in disbelief. And that is the thing that impressed her most. Sure, the Kogelo progeny made good and everyone proud, but she's just as amazed by his opponent's quick willingness to accept defeat. To me, it's so ordinary I've already blithely assigned cynical motives to his graciousness. We take it for granted that the opponent will accept his loss, take some Prozac and move on. As will his supporters. Our country will not erupt in violence like Kenya tragically did in 2007 during their last presidential election. Half the people in the US are disappointed but will not take to the streets. Why? Real social scientists have better answers to that question, which I am sure have a lot to do with things like the faith people have in the justice and transparency of the voting system, the history of peaceful handovers of power, unemployment rates, and the overall percentage of young people (those perennial rabble rousers). But I think it's also that the outcome of an election simply matters more in other places. In Kenya, if your guy gets a seat in Parliament you just might share in some of the spoils. Presidential homelands have better roads, hospitals and services. One of the most insightful books about Kenyan politics is called "Our Turn to Eat," a phrase basically meaning: It's enough of the other group's hand in the government kitty, it's our tribe's turn. It does matter, in some material sense, if your guy wins. But no matter who won this US election, not much will change for me or my family personally. Despite all the talk about the "direction of the country" and who can "get the economy moving" the fastest, neither guy was going to wave a magic wand or even get their playbook implemented and suddenly change the array of opportunities available to me. Yes, a president makes some key appointments, sets a tone and, if he's lucky, an agenda, and has a bully pulpit. But much of what they can accomplish is hindered by things totally out of their control, like Congress, financial markets, natural disasters and Fox news. So, maybe the question isn't why the losers aren't taking to the streets, but why do we care about the result at all? And here at least part of the answer is surprisingly tribal. I want Obama not because I think I'm going to personally benefit but because I think he represents my values more than the other guy. That the government's role is to protect our precious public goods like natural resources, public health and human rights, which are sometimes trampled by capitalism; to protect our growth and development by investing in quality education for everyone despite where in the country they may have been born; to ensure that the winners of capitalism don't use that power to undermine our democracy; to use our considerable wealth and power to make the world a more peaceful place. He represents my ideological tribe. And I want my people to win. My husband, who shares my politics, was remarking that when he really thought about it Obama has disappointed him in certain ways and Romney, given his proven track record as a manager and history as a fairly progressive Governor, might not even do that bad of a job in the White House given a a more moderate Congress. Still, he said, he had an emotional attachment to the Obama win that felt something like his emotional attachment to a Patriot's (football team) win, which borders on the obsessive. (Let's just say the Superbowl loss of 2008 resulted in a sick day.) He was baffled by his own crushing disappointment after Obama's lackluster debate performance and euphoria when the poll numbers started turning back around in his favor. His took another look at his own emotions. They were tribal. He wanted his team to win. So, again here, we might not be all that different. Unlike a lot of new democracies, our political parties stand for something other than identity politics (though maybe the post-mortem political commentators need to be reminded of that!). But still, our identities are now wrapped up in our ideology instead of our ethnicity. "The other" in my America is not necessarily someone who looks different than me, but someone who thinks differently from me. And, I'm thinking more and more that how we tolerate those differences is going to define the future of our country. And... we are a two party system - not a parliamentary democracy, which makes a difference about how we view winning or losing. We know that we have to wait 4 years to make a change, not that we have to see if someone can form a government. Third party politics don't have resounding success in our history (the Tea Party notwithstanding). I think ethnicity still plays a role in American politics - look at the emphasis on the Latino and African-American vote in the postmortems as to why the Republicans lost. Yup. Ethnicity certainly plays a role in the US too (that was my final parenthetical comment in the post, but maybe it was too obscure?) Anyway, it's just that it doesn't play the ONLY role as it does in so many other places. Interesting point about the parliamentary democracies and coalition building. Love how thoughtful you are in stating your stand. Thanks Alison! I think it's a stand. The post kind of meanders. Maybe it's more of a train of thought than a "stand." ;) I guess my stand it being thankful for the relative peace and predictability of our election process and then also realizing there's a lot more tribal about our allegiances than we might suspect. I've been wondering why I had such an emotional reaction to Obama's win, when I don't even live in the U.S. Yes, Canada is affected by the States' actions, but realistically it's unlikely I'd be tangibly affected by the election outcome. But you're so right - he's my ideological tribe and that's why I care. Hi Azara, That's a perfect example of a true emotional attachment to the US race - when you're truly not affected by the outcome. Great point. And, I don't feel spammed at all! It's nice when someone I don't know reads this blog and nicer still when they say they enjoy it!! I'm flattered! It's so nice to read such a fresh perspective on politics. It's true, even our "worse" candidates are not nearly as terrible as in other countries. And we do take for granted our right to vote, to express our feelings, to criticize the opposing party. When the election results came in, I was surprised that my reaction was an overwhelming sense of relief. As in I sighed a sigh bigger than any sigh I'd ever sighed. Relief. Because he stands for my values, too, and I was really starting to worry that my values were going to get lost in the political rhetoric of the right. Relief. I definitely agree that it would take quite some time before either candidate would have been able to make any waves that we would feel. It would be wonderful to have a fairy godmother as President of the US to wave her wand for us and make everything better. The day after the election, I told my son that Obama had won, and I said, "Go Obama!" and then I thought I should be a good sport, so I said, "But I'm sure either one of them would have done a good job as President." My six-year-old then said, "How do you know? How do you know Romney would have done a good job? Has he ever been President before?" Hmm... well, no. Good point, son. At least with Obama, we know what to expect. Really interesting perspective! Thanks for sharing. "The other" in my America is not necessarily someone who looks different than me, but someone who thinks differently from me. This line stuck out for me. And then how we handle those differences. With a lot of relationships or my feelings about certain people, I feel the tribal thing... a sense that we share a common history, ground. Very thought provoking post. I'm still mulling it over as I finish typing here. Nothing like some Kenyan perspective to make it seem strange that we get so vitriolic about politics over in North America. And I agree with Gina's comment about your line defining "the other"... what wise words. Always great to hear your perspective. I think this election would have been more pleasant from a distance of a few thousand miles! I am probably the least political person out there, but I was rooting for Obama and relieved when he won. And I'm Canadian so it shouldn't have mattered as much as it did. How interesting to be in Kenya during this election. I love your perspective. Thanks for sharing. I am totally with you on this. I voted for him because he seems like he shares more of my values. I hope no one asks me to be more specific, because for me it just might be "I know it when i see it" kind of answer. So grateful to read your words. This is a well written post that really brings home just how functional our democracy is on some key levels. Even in a hotly contested, close election the results are respected and the country goes on with business at usual. We tend to take that kind of stability for granted but when you think about it it really is quite remarkable. Great post!